How does blocking work in this scenario exactly? Can Gaes' Revenge be a legal target of multicolor Spells that contain green? Can I clone a clone, to make a clone? You may want to consider Angelic Renewal in this deck. 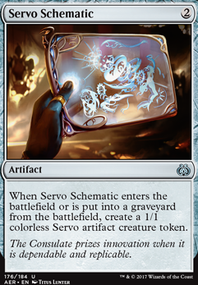 The way it works with Evoke, you pay the Evoke cost, and by sacrificing Renewal, you get to keep the creature, as well as the ETB when returns to the battlefield. I've run the interaction in Pauper decks, and it's hilarious to do things like turn-2 Renewal, turn-3 Mulldrifter to draw 4 and get a 2/2 flier. You can do similar things by exiling the creature before it's sacrificed with Parallax Wave , Deadeye Navigator , Roon of the Hidden Realm , and Endless Sands . If you like that plan, I would include AEthersnipe and Walker of the Grove , too. Also, if you're running Reveillark , you should probably be running Karmic Guide for the combo. I'm also a little confused as to why you're not running Scapeshift in a Gates deck, especially one full of Landfall creatures. Other good land-fetch cards include Skyshroud Claim , Hunting Wilds , Ranger's Path , Wood Elves , Krosan Verge , Nature's Lore , and Karametra, God of Harvests , all of which fetch your Shocklands. Path of Ancestry is fantastic in tribal decks, and it is an absolute staple in 5-color tribal decks. This would also be a good deck for the Pickles Lock. Brine Elemental already plays to your theme, and you have multiple ways to tutor it. Vesuvan Shapeshifter is a clone at worst. 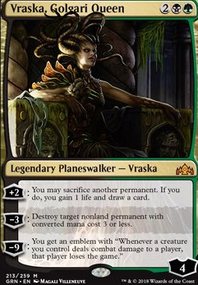 The final thing I would do is include some looting effects and self mill that won't put your Gates in the yard, since your commander wants expensive Elementals to reanimate. Kiora, Master of the Depths and Mulch could be good on the mill side, and Faithless Looting , Frantic Search , Greater Good (You can sac Evoked elementals in response to the trigger! Value! 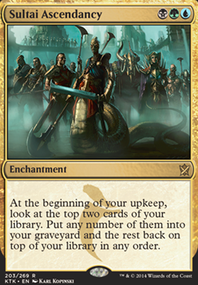 ), Sultai Charm , and Chart a Course are all good for looting. Also, Surveil can help to fill the yard, as well. Try Notion Rain and Price of Fame (Good for killing Commanders!). As for cuts, I would lose Brighthearth Banneret (land ramp is just better most of the time), Fertilid (7-mana Explosive Vegetation is bad, even if it has recursion), Rubblehulk (no ability, so it'll just get chumped for days. Run Multani, Yavimaya's Avatar if you want the land-count effect), and Tyrant of Discord (too expensive for a random effect). :Put a blaze counter on target land without a blaze counter on it. This is one of my favorite casual archetypes, and nice execution here. 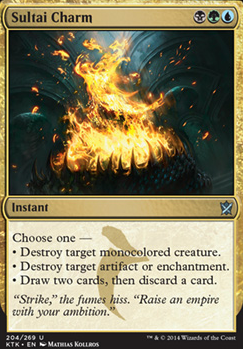 I would suggest cutting the Sultai Charms and maybe a couple of Chart a Course for some 1-mana discard, like Duress or Thoughtseize, depending on your budget. It's not truly ramp, but adding some 1-2 mana control pieces like discards and counterspells help get you the time you need. I also suggest adding at least two more lands. How is Villainous Wealth working for you? I've never been able to get it running right without a much heavier green presence. Is it treating you better? It's ANY CARD. AT INSTANT SPEED. It doesn't require to be only black. That means you can go get a Liliana of the Veil or something more fancy like Dreadbore or Sultai Charm at the end of your opponent's turn. It finds you answers and essentially turns your deck into a toolbox. You could also go 5c aggro and have this to find the right creature at the right mana cost at the right time :D the possibilities are endless, my friend! Archetype of Endurance. This card is very powerful to be sure, but Muldrotha already needs a lot of mana to function, and you don't have very many ways to cheat it into play. Butcher of Malakir. Grave Pact and Dictate of Erebos are more expensive money-wise, but being cheaper on mana and also more resilient makes them much, much better. Deranged Assistant. It looks good at first glance, but it's a 2-mana dork, and you're not playing any of the 1-mana dorks anyways. The single-card mill is a very minor upside. Nyx Weaver. It can be very good, but it's just too slow. There are much better ways to mill yourself, and a 6-mana Regrowth is way too much mana. Progenitor Mimic. A powerful card to be sure, but this isn't the deck for it. Slum Reaper. I think this card is only really worth running in decks that badly need the 3rd Fleshbag Marauder. Shriekmaw is almost always going to be better. Aether Spellbomb. Looping it can be fun, but bouncing a creature is a terrible waste, and there are better ways to draw cards with artifacts. Perpetual Timepiece. This card was good on Game Knights when they were only using Standard cards, but we have better options. Plague Boiler. This card is also cool, but once again, we have better choices. Demonic Vigor. Fun with Muldrotha, but there is usually so much exile-based removal in Commander that this card isn't as good as you think. Hesitation. Sweet include, but looks a little too cute. Very easy to play around, and also counters your spells. Skeletal Grimace. Same as Demonic Vigor. Hope this helps! Feel free to leave a comment on my profile if you'd like further suggestions for this or any other deck! Good luck! I would look at the charms...Jund Charm, Bant Charm, Naya Charm, Esper Charm, Mardu Charm, Sultai Charm, Temur Charm,Abzan Charm, Rith's Charm ect. 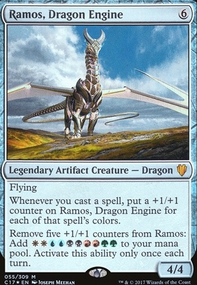 3 mana, 3 counters for Ramos, and a ton of different effects for multiple situations. Obviously not all of those should go in your deck, but I would definitely throw in your favorites.